Libgta, a library that reads and writes GTA files, with interfaces in C and C++. 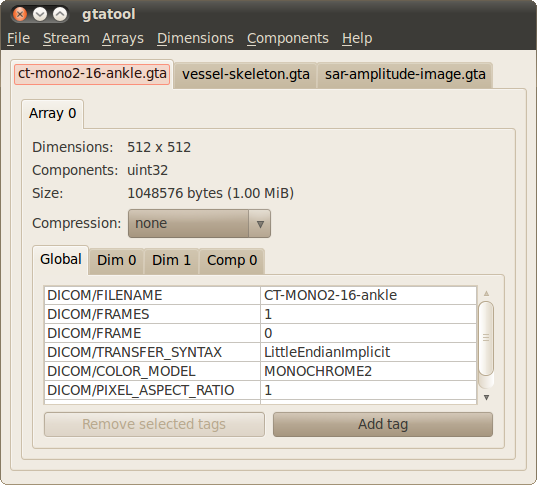 Gtatool, a tool that manipulates GTAs and converts GTAs to and from other file formats. 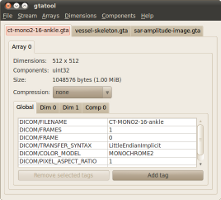 Gtatool provides a set of commands that manipulate GTAs on various levels: array element components, array dimensions, whole arrays, and streams of arrays. For example, you can add components to array elements, merge separate arrays into combined arrays in different ways, apply global transformations to array data, reorder the array data, and much more. The gui command provides a graphical user interface for a subset of the full functionality. Both libgta and gtatool are free software. Libgta is licensed under the terms of the GNU LGPL version 2.1 or later, and gtatool is licensed under the terms of the GNU GPL version 3 or later.